The cranial computed tomograph (CT) has assumed a critical role in the practice of emergency medicine for the evaluation of intracranial emergencies, both traumatic and atraumatic (trauma, stroke, subarachnoid hemorrhage, intracranial hemorrhage). Some things can wait for Nighthawk / radiologist reads . . . some things can’t. The emergency physician should be able to rule-in or rule-out life threats identified on CT and act on them. Windowing allows the CT reader to focus on certain tissues on a CT scan that fall within set parameters. 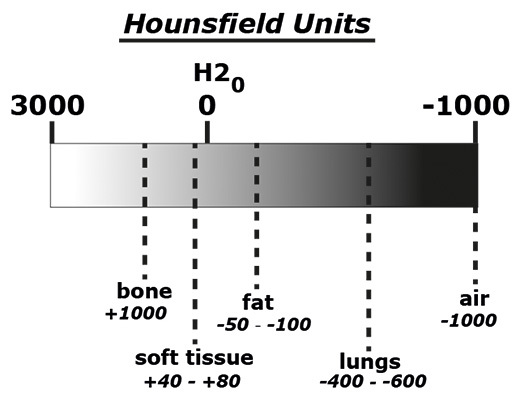 Tissues of interest can be assigned the full range of blacks and whites, rather than a narrow portion of the gray-scale. With this technique, subtle differences in tissue densities can be maximized. Utilizing a systematic approach is one way that the clinician can ensure significant neuropathology will not be missed. Just as physicians are taught a uniform, consistent approach to reading an ECG (rate, rhythm, axis, etc. ), the cranial CT can also be broken down into discreet entities, attention to which will help avoid the pitfall of a missed diagnosis. One suggested method to avoid missing an emergent diagnosis is to use the mnemonic “Blood Can Be Very Bad”. In this mnemonic, the first letter of each word prompts the clinician to search a certain portion of the cranial CT for pathology: Blood = blood, Can = cisterns, Be = brain, Very = ventricles, Bad = bone. If present, what effect is it having? 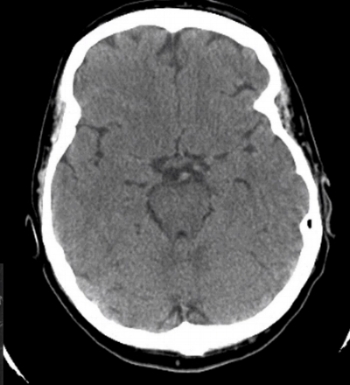 Traumatic intracerebral hemorrhages may be seen immediately following an injury, most commonly occurring in areas where sudden deceleration of the head causes the brain to impact on bony prominences (temporal, frontal, occipital poles). Is there blood (subarachnoid hemorrhage)? 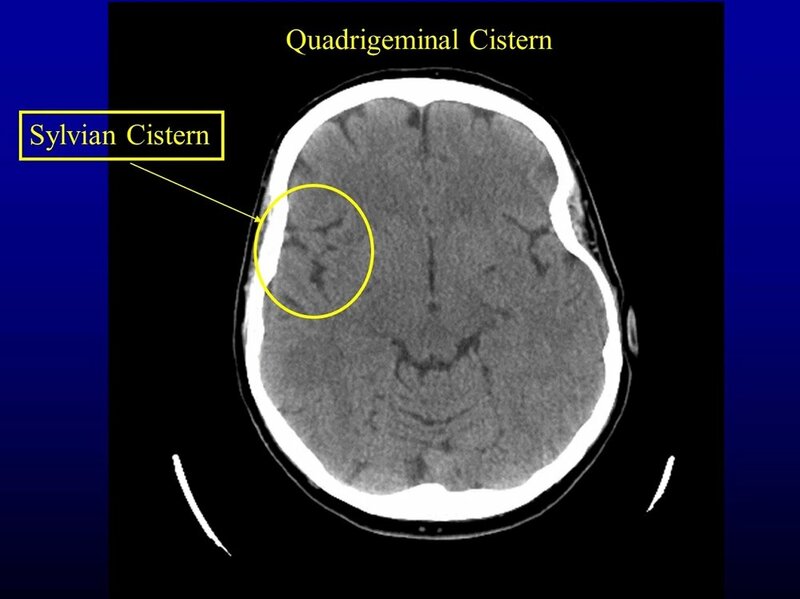 Are the cisterns open/is there high intracranial pressure? 80% of subarachnoid hemorrhages happen somewhere around the circle of willis/suprasellar cistern. One of the earliest places to see hydrocephalus is on the temporal tips of the suprasellar cistern. A SAH here may only fill up this cistern with blood. The insular ribbon is the end organ of the middle cerebral artery - it is the most distal brain perfused by the MCA. 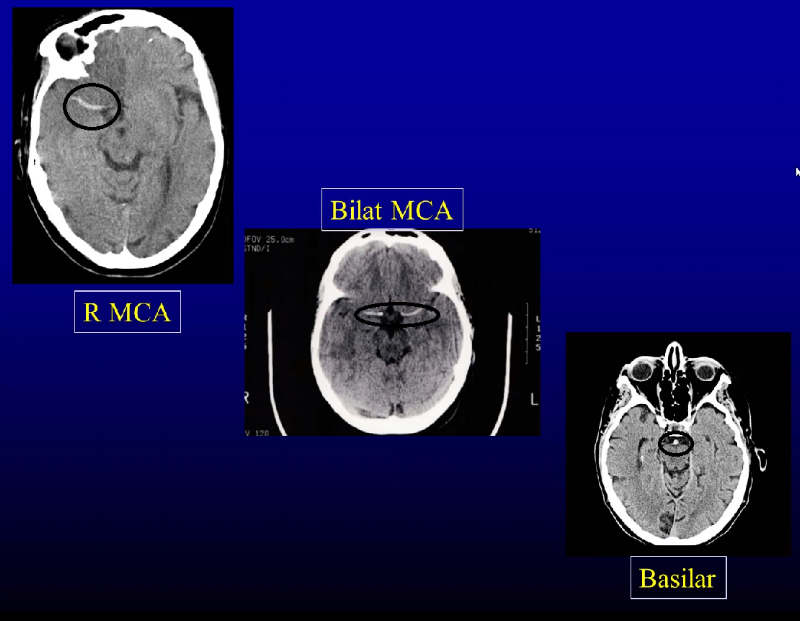 Loss of gray white matter here is the earliest sign of MCA ischemia. Make sure sulci and gyri appear the same on both sides. Check for effacement of sulci (unilateral or bilateral). 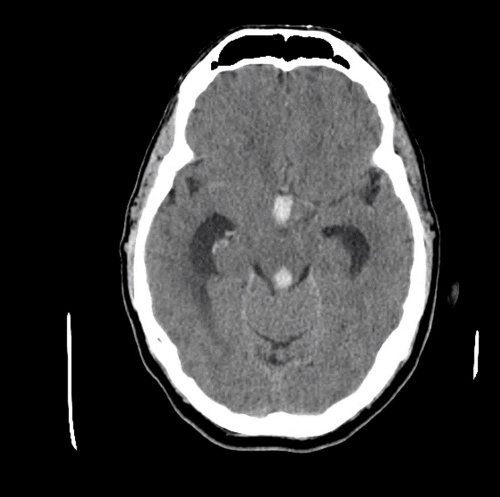 The earliest sign of a CVA on CT scan is the loss of the grey-white interface on CT scan (see next image below). Compare one side to the contralateral side. 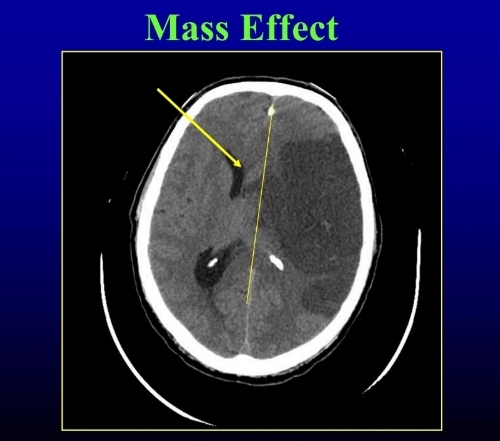 To evaluate for mass effect, evaluate a mid line structure (septum pellucidum) for shift. The falx should be in the mid line with ventricles the same on both sides. Blood, calcification and IV contrast are hyperdense (appear lighter) and air, fat and areas of tumor, ischemia are hypodense (appear darker). Examine the third, fourth and lateral ventricles for dilation or compression/shift. 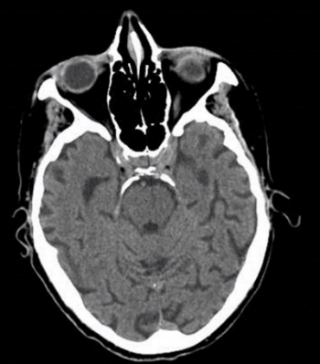 dilated ventricles are seen on this CT brain. 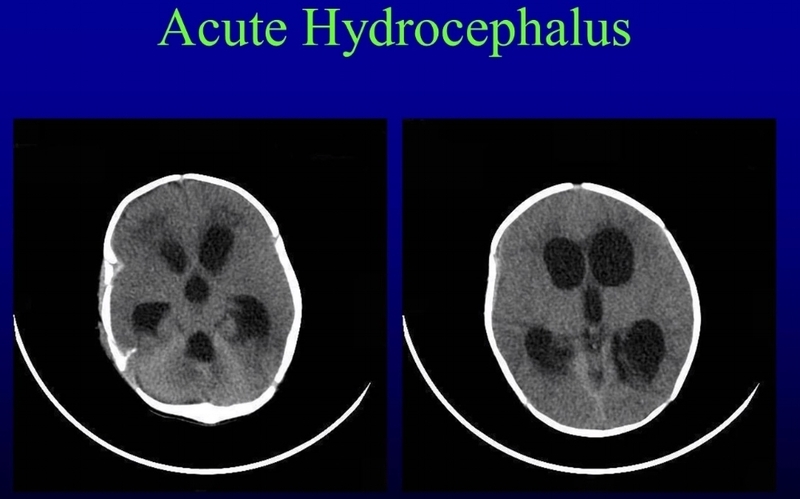 no GrEy-white differentiation or gyral PATTERN suggests this hydrocephalus IS ACUTE. Diagnosing skull fractures can be confusing due to the presence of sutures in the skull. Skull fractures are divided into nondepressed (linear) or depressed fractures. The presence of intracranial air on a CT scan means that the skull and dura have been violated at some point. Non-aerated mastoid air cells suggest basilar skull fracture in petrous ridge. The maxillary/ethmoid/sphenoid sinuses all should be visible and aerated: the presence of fluid in any of these sinuses in the setting of trauma should raise suspicion of a skull fracture. 5. Roszler MH et al: Resident interpretation of emergency computed tomographic scans. Invest Radiol 1991;26:374-376. General Reference: Cwinn AA et al: Emergency CT scans of the head: a practical atlas. Mosby Year Book, St. Louis, 1998. Lee SH et al: Cranial MRI and CT, 4th ed. McGraw-Hill, New York, 1999.